Don’t use a flashlight when a headlamp will be twice as nice! From running and jogging to exploring the depths of a forgotten cave, headlamps illuminate your surroundings while leaving your hands free to work and play. Fenix offers a wide variety of headlamps designed for hobbyist and professional users alike, realizing the needs and demands vary greatly. If you’re looking to grab a new Fenix headlamp for your gear but need some help navigating your choices, look no further. We’re breaking down everything you need to know about Fenix’s different headlamps to help you buy with confidence. Let’s dive in! Fenix’s HL headlamp series features an extensive lineup of lightweight and compact headlamps ideal for active sports like running and cycling, camping, emergency backup, home repair and other general uses. Many headlamps in this line also include an “R” designation in their model name, like the HL60R, which indicates the headlamp includes built-in charging. For more active users, you can’t go wrong with options like the Fenix HL12R, HL26R or HL32R headlamps which all maximize comfort while still providing plenty bright outputs. The HL12R and HL32R both offer secondary red outputs (a must-have if maintaining night vision is important to you) while the HL26R gives you the choice of spot or floodlight. If you need something more powerful, the Fenix HL60R headlamp offers the performance of a full-size headlamp while utilizing a single 18650 to balance comfort. Although there’s only one model in this series, the Fenix HM50R headlamp is one of our all-time favorites. This mini, rechargeable headlamp can be converted to a handheld torch by removing it from the headband bracket, giving you even more functionality from your light. And the 500 lumen output is just perfect for everyday carry, outdoor sports and emergency backup. If performance is your top concern, the Fenix HP series is your best friend. 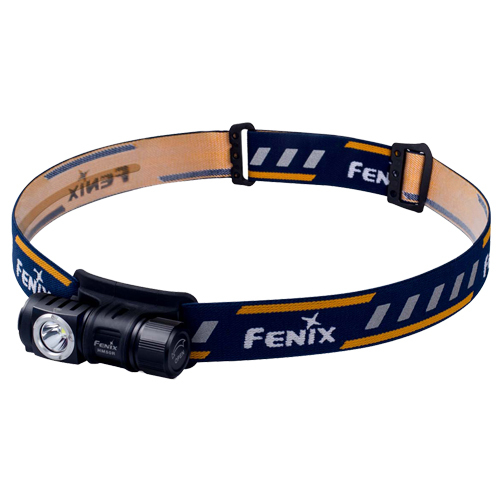 These professional-grade headlamps feature the brightest and longest running headlamps Fenix makes. From the Fenix HP15UE which uses 4x AA batteries to provide 900 lumens of light to the Fenix HP30R which reaches an incredible 1750 lumens from 2x 18650 batteries, these headlamps are excellent for caving, exploring and hunting as well as professional use. To handle the increased battery demands of the HP Series, these headlamps all use external battery packs that balance on the back of the headband or on a belt. For longer treks and extended usage, you’ll definitely appreciate this extra attention to comfort and practicality.